At Fountain City Animal Hospital, your pet gets the benefit of care given by many hands, many heads, and many hearts. Our support staff is such an integral part of patient care here, to call us a “team” is an understatement. Our goal is to work as one unified entity, from the reception desk all the way to the kennel area of the hospital. We have systems in place to ensure that the right hand always knows what the left hand is doing, and every member of the staff plays her part excellently. Dr. Khalsa, born in rural Pennsylvania and raised in New York City, attended Vassar College for her undergraduate education, and the University of Pennsylvania College of Veterinary Medicine, graduating in 1977. After surviving two of the most prestigious institutions of higher education, she still considers relocating to East Tennessee among the smartest decisions she ever made. She opened Fountain City Animal Hospital in the summer of 1979 in a small rental building in the heart of Fountain City, with the vision of providing quality veterinary care, always with a gentle touch. Decades later, after quickly outgrowing the original building and relocating to our present location on Black Oak Ridge, she has managed to gather a group of professionals and support staff who share her goals and her drive for excellence in all things. Dr. Khalsa loves every aspect of small animal veterinary practice but finds particularly rewarding the challenge of complex medical cases. She has enjoyed dermatology ever since being inspired by an excellent derm professor way back in vet school, and has countless rewarding experiences treating a variety of conditions with acupuncture. Dr. Khalsa and her husband of more than 40 years have raised two children in Knoxville and are now the proud parents of two beautiful grandchildren who are also blessed with the support of this wonderful community. Of course, the Khalsa household includes multiple four-legged family members who have always enjoyed the quality care Fountain City Animal Hospital provides. When Dr. Khalsa takes time away from the practice, it is often filled with travel to some place in the world that provides a backdrop of sand, sun, sailboats, and beautiful coral reefs for scuba diving. She is also busy writing several books, one of which includes extraordinary stories of ordinary veterinary practice. Dr. Cooper was born in Kingston, Jamaica and moved with her family to Houston, TX at age 6. She attended Texas A&M University for both her undergraduate and veterinary training and was awarded her DVM degree in 1996. Luckily for Knoxville, she chose to come to the University of Tennessee for her veterinary internship and decided to start her family and settle here. She worked in another private practice for a few years before settling in comfortably with the Fountain City Animal Hospital family. Dr. Khalsa was interested in having her join the practice from their very first meeting, but it wasn’t until 2005 that she had an opening to offer her. It is the sense of true “second family” that Dr. Cooper feels with her coworkers that makes working at Fountain City Animal Hospital so special for her. Dr. Cooper is an excellent diagnostician and surgeon, always enjoying the back-and-forth the doctors engage in when presented with complex cases, but her special interest is in cardiology. She has been honing her skills in echocardiography for many years and enjoys the challenge of deciphering the true meaning of all the information gleaned from physical exam findings, chest x-rays, blood pressure evaluations, EKG and Holter monitor readings, and echocardiogram findings. She is the mother of two beautiful school aged children so has a very busy life balancing work, family activities, and the needs of her goofy pit bull dog Pete, two cats, and a tankful of fish. On top of all that, no weekend is complete without her giving full attention to a couple of football games (college or NFL, no matter to her!). When football season is over, there’s always crocheting. Dr. Murray was born in West Virginia and moved to TN with her parents and four younger siblings in time to start high school. She attended Virginia Tech for both her undergraduate and veterinary degrees, and graduated with her DVM in 1994. She worked at a small animal practice in Johnson City until 1999, when she and her husband moved to Knoxville so he could continue his education at UT. She came to Fountain City Animal Hospital then, and hasn’t looked back for a moment. What she enjoys most is the professional camaraderie at Fountain City Animal Hospital, where the doctors freely collaborate on complex cases with mutual respect. She finds working in cooperation instead of in competition makes for both a better work environment and results in better care for every patient. With her ever-supportive husband, she is raising two extraordinary teenage children who model their mother’s intelligence and drive for excellence. The outliers in this family of high achievers are the Murray household pets - a lazy greyhound and a bunch of freeloading cats. But she loves them all, and they are guaranteed a fairy tale life simply by virtue of being part of the Murray household. We feel so grateful that Dr. Neff and her husband have chosen to settle here in East Tennessee, because prior to that decision, she was a world traveler and could have put down roots just about anywhere on the planet - truly. She’s seen six out of seven continents on the earth, speaks fluent German, and maintains her drive to travel even now. She was born in Northern California and graduated from the University of California at Davis with a degree in Avian Sciences (yes, she is passionate about birds of all sizes and shapes, from psittacines to raptors). Next stop was Purdue University where she attended veterinary school and met her husband who was studying nuclear engineering. Completing his PhD required another move to Illinois, where Dr. Neff worked in a progressive small animal hospital and acquired valuable experience and honed her skills to become an outstanding companion animal veterinarian. Being a well-rounded small animal practitioner, she has experience in all aspects of internal medicine, surgery, wellness, pediatrics, and geriatrics. Her special interests extend beyond the avians, into all manner of exotic animal medicine. If you have a pocket pet (hamster, gerbil, or even a rabbit), she’s the one to care for that little fuzzy one. Presently her home is populated by (only) 2 cats, a bird, and as of February 2018, a new baby girl. After life settles down a bit after the arrival of the Neff family’s beautiful two-legged addition, the intention is to add to the furred and feathered population as well. In case Dr. Neff finds any free time, she is likely to be found pursuing one of her other varied interests as an avid photographer or gardener. If the weather prevents outdoor activities, she very well might be found busily crafting or using her creative energy in the kitchen cooking or baking. As are all the vets at Fountain City Animal Hospital, Dr. Ward is a very well-rounded practitioner, but her special interests are in dentistry and surgery. She is the go-to doctor in the practice for orthopedic procedures but also enjoys and excels in soft tissue surgery. All the doctors at Fountain City Animal Hospital do whatever we can to help you keep your pets’ teeth clean and healthy, but when serious issues arise and any advanced procedure is needed, her expertise is on call. Being a veterinarian and mother of one rambunctious little boy might seem challenging to many, but Dr. Ward manages her time well enough that she has adequate time to spend hiking and boating on Norris Lake with her husband and son, and taking care of her nutty little terrier, Lubee, and two cats. When she has true “down time,” she will unwind doing textile crafts (why is this not surprising for a surgeon?). Carol has been a Licensed Veterinary Technician (LVT) since 1994, and her technical skills have helped us save countless lives and have ensured top quality care for your pets over the decades. She is a valuable mentor for our younger technicians, eagerly sharing her experience and expertise in the laboratory, in the dental suite, in the ICU, in the surgery room, in the exam rooms, and even occasionally at the front desk. In addition to all of her technical responsibilities, Carol is also our Practice Manager. She is passionate about Golden Retrievers, actively involved with TN Valley Golden Retriever Rescue. Although she feels like an indispensable member of the staff, we all understand that she may be deployed at a moment’s notice to participate in her duties with the National Veterinary Response Team, the primary federal resource for the treatment of injured or ill animals affected by disasters and for providing medical support to all federal working dogs. With all of her varied experience, she values her life here at Fountain City Animal Hospital most because of the superior quality of care she sees here combined with the most caring and compassionate co-workers. Jennifer (L.V.M.T. LMU 2010) first began working at Fountain City Animal Hospital as a teenager at our front desk many years ago. Once realizing the depth of her passion for veterinary medicine, she committed to fulfilling her goal of becoming a licensed tech, which she accomplished in 2011. 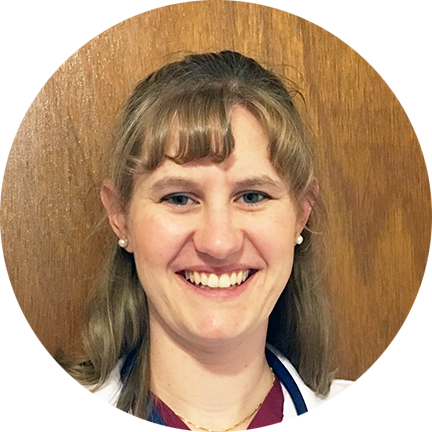 After a few years in emergency medicine and one in a dentistry specialty practice, she found her way back home to Fountain City Animal Hospital in 2012. All grown up now, with a wonderful husband and two beautiful sons, she balances it all, always with a smile on her face. She is our primary dental technician, but her skills are broad enough that we can count on her to serve anywhere in the hospital. She finds at Fountain City Animal Hospital a true second family who all love their job, love the animals, and love the clients they serve on a daily basis. Kayla (L.V.M.T. LMU 2015) is one of our newest licensed techs, but she has proven to be a very valuable member of the team, always willing to pitch in when and wherever she is needed. Before coming to Fountain City Animal Hospital, she spent summers working at another small animal facility, but seems to have found her true home here. She is deeply grateful for the mentoring she’s been provided by our senior staff and believes strongly that it was their help that made it possible for her to sail through her licensing exam after graduation. She feels she couldn’t have found a better place to start her career. Lydia (projected L.V.M.T. late 2017) has been with us at Fountain City Animal Hospital since 2011. It didn’t take long for us to recognize her tremendous potential and for her to realize her deep love for small animal veterinary practice. Being a new mom, she found a way to continue to work but still have time with her baby boy by taking advantage of Penn Foster’s on-line fully accredited veterinary technician’s program. She feels that the staff at Fountain City Animal Hospital are more than simply co-workers, but rather a village of women who lift each other up and help one another be the best we can be. Stefani (Petsmart Certified Groomer 2010) attended Edison State College and Virginia College. She joined the team at Fountain City Animal Hospital when she and her family moved from Seattle to Knoxville in 2013. Prior to coming to TN, Stefani worked for eight years in other small animal facilities out of state. She started at our reception desk, where her genial nature and attention to detail were quickly revealed, and then moved seamlessly into her position as groomer when the need arose. She continues to move back and forth between the two positions, as needs dictate. Like so many of the staff here at the hospital, she feels that her co-workers are second family, and her belief that she is in the right place is confirmed every day when she realizes that she loves coming to work. Soubhi has worked with animals in varying capacities for her entire adult life. She first came to Fountain City Animal Hospital in 2009, after having worked as an assistant at the Humane Alliance Spay Neuter Clinic in Asheville, NC, and prior to that, as a manager at the Friends For Animals Shelter there. She worked for us as both a veterinary assistant and as a groomer before leaving with her husband for a 4 year hiatus in Austin, TX. Soubhi’s grooming experience dates back to 1996 when she began a three year apprenticeship at Asheville Village Groomers, and after all these years and varying experiences, that is still what fills her heart the fullest. Soubhi readily admits to being owned by two hairless kitties and a very mixed breed little brown dog who complete her family, along with her ever-supportive husband. Her artistic talents extend beyond pet grooming to gardening, stained glass creation, and dance. She couldn’t be happier to be returning, not just to a field that she loves, but to a group of coworkers who feel like family! Chelsea has been an invaluable member of the staff at Fountain City Animal Hospital since she was a young teenager, having started volunteering in the kennel when she was still in high school and officially coming on board in 2006. Her intelligence and attention to detail didn’t go unnoticed for long, and she quickly made her way to the front desk where you all are familiar (by now) with her smiling face and exquisite attention to detail. She always gets it right! Her devotion to animals extends past her “day job” into her dedication to the Greyhound Rescue Foundation for whom she volunteers fostering greyhounds in her home. She loves how compassionate and caring her co-workers are here at the hospital and can’t imagine working anywhere else. Jessica is another of our devoted reception staff whose soft heart (HOW many cats has she rescued?) and sharp mind make her a principal player at our front desk. Always willing to go the extra mile for clients and co-workers alike, you can depend on her for exquisite care for both the pets and their people. She’s been part of the Fountain City Animal Hospital family since 2009, where she began working directly with the animals in the kennel, but found herself transferred to the front desk when we realized that her dedication to serve people was as intense as her dedication to serving the animals. She values deeply the fact that everyone who works here is so highly driven to help the animals who come our way and wouldn’t want to work anywhere else.